I wrote in a previous article about why we should backtest even end-of-day (daily) strategies with intraday quote data. Otherwise, the performance of such strategies can be inflated. Here is another brilliant example that I came across recently. we see that though the slope is indeed -1 (to within a standard error of 0.004), there are many days with significant deviation from the straight line. The trader in us will immediately think "arbitrage opportunities!" We can see that the problem is not only that we lose money on practically every trade, but that there was seldom any trade triggered. 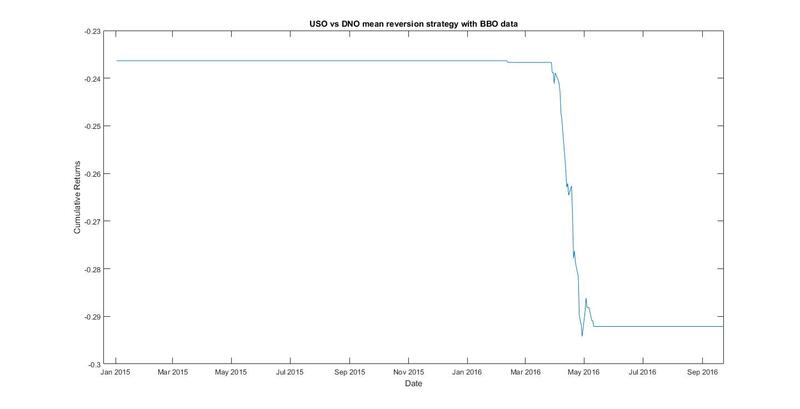 When the daily EOD data suggests a trade should be triggered, the 1-min bar BBO data tells us that in fact there was no deviation from the mean. 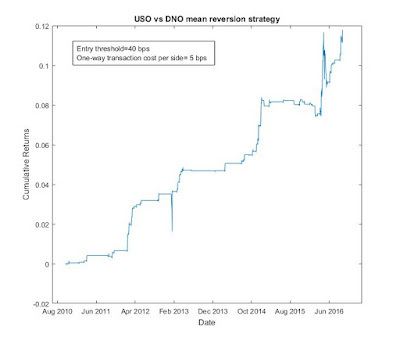 In case you think this problem is peculiar to USO vs DNO, you can try TBT vs UBT as well. 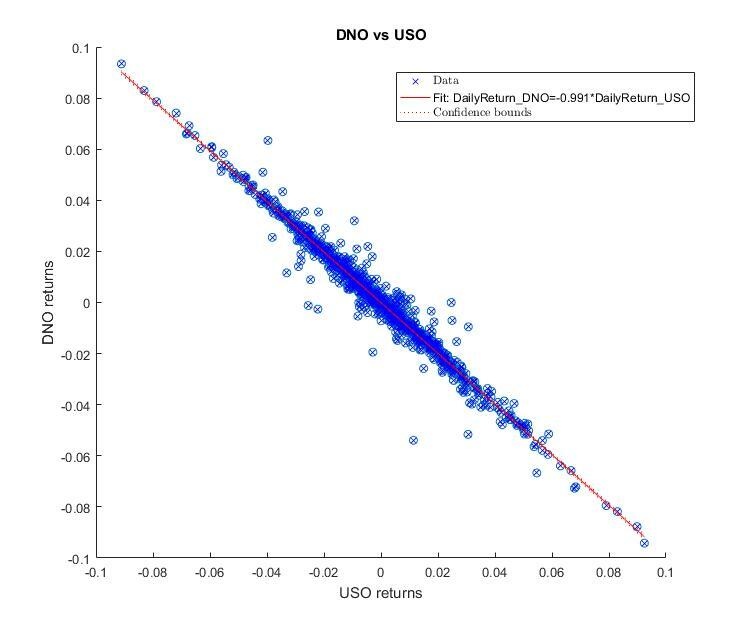 Incidentally, we have just verified a golden rule of financial markets: apparent deviation from efficient market is allowed when no one can profitably trade on the arbitrage opportunity. 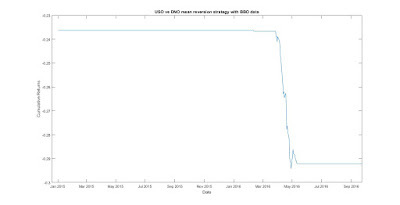 *Note: according to www.etf.com, "The issuer [of DNO] has temporarily suspended creations for this fund as of Mar 22, 2016 pending the filing of new paperwork with the SEC. This action could create unusual or excessive premiums— an increase of the market price of the fund relative to its fair value. Redemptions are not affected. Trade with care; check iNAV vs. price." For an explanation of "creation" of ETF units, see my article "Things You Don't Want to Know about ETFs and ETNs". I will be moderating a panel discussion on "How can funds leverage non-traditional data sources to drive investment returns?" at Quant World Canada in Toronto, November 10, 2016. October 22 and 29, Saturdays, Quantitative Momentum Strategies online workshops. Momentum strategies are for those who want to benefit from tail events. I will discuss the fundamental reasons for the existence of momentum in various markets, as well as specific momentum strategies that hold positions from hours to days.